As controversy continues to trail the Osun State High Court ruling allowing the use of hijab for female students of the Islamic faith in public schools in the state, the state chapter of the Christian Association of Nigeria (CAN) yesterday organised a joint prayer rally for the return of sanity in the state. The prayer rallies were attended by over 200 pastors and thousands of Christians across all denominations in the 30 local government areas of the state including the Ife East area office, which was held in Dominion Hall of Osun Baptist Conference, Gbodofon, Osogbo and centred on the court ruling paving the way for the wearing of hijab. However, at the Baptist School, Iwo, where students attended school in church vestments on Tuesday, was invaded by security operatives yesterday. This was just as the traditional ruler of the community, Oba Adewale Akanbi, was said to have waded into the matter to forestall a crisis. The prayer rallies, which were organised by the state CAN chairman, Rev. Dr. Elisha Ogundiya, and led by his deputy, Pastor Moses Adedeji Ogundeji, according to CAN, were meant to reject the court ruling on the wearing of the hijab in public schools and the alleged plot to Islamise the state. Ogundeji added that the prayers were also meant to seek for peace from God and to nullify any “anti-kingdom laws and dealings with satanic forces that have been tormenting the state for the past few weeks”. He contended that inasmuch as stakeholders in the state were trying to resolve the crisis with prayers, “if government should expel any Christian pupil or student, it means all the students in public schools would be sent packing”. Ogundeji however noted that the prayers would ensure that Osun State is delivered from the “power of satanic forces and oppressors”, adding that all “powers that are set to destroy Osun State would be destroyed by God”. “The country has no rest from the hands of Boko Haram, Niger Delta Avengers, and (Fulani) Bororo herdsmen; therefore let there be peace in Osun and let the state be free from the shackles of evil and oppression,” he added. The CAN vice-chairman described the presence of security personnel around the prayer venue as an embarrassment because the event was meant to be peaceful. 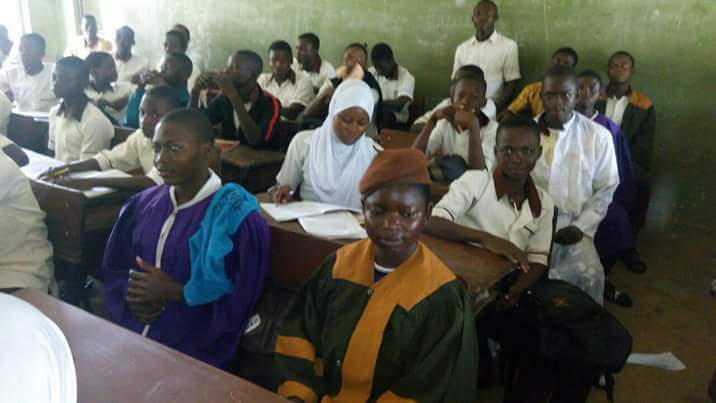 The controversy over the hijab assumed another dimension in Osun on Tuesday when students appeared in their schools in church vestments. 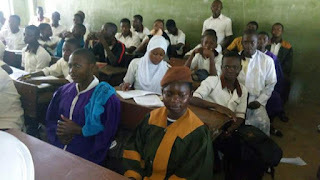 The appearance of students of Baptist High School, Iwo, in different church vestments raised eyebrows, even as other students who were in school uniform hailed them. Also some female Muslim students who appeared in their hijabs equally gained access to the school without restriction. CAN had threatened that it would direct Christian pupils to start wearing church vestments to schools should the court judgment be implemented. Meanwhile, an Islamic group known as Tebliks, yesterday stormed the Baptist High School in Ede to enforce the use of the hijab by those identified as Muslim female students of the school. Owing to the intimidating presence of the group, some Muslim female students were prevented from entering the school because they didn’t adorn the hijab. Shortly afterwards, academic activities in the school were stopped as the group also stormed classrooms to stop the teachers on duty. Also, it took the intervention of the Oluwo of Iwo, Oba Abdulrasheed Adewale, Telu I, to avert a clash at the entrance of Baptist High School, Adeeke, Iwo, as some students of the school, for the second time this week, turned up in church vestments. Before their arrival, heavily armed policemen were stationed at the gate of the school as early as 7 am and movement in and out of the school was unhindered. But tension arose when security operatives attempted to stop some students who wore the church vestments from entering the school premises, a move that was resisted by some parents who accompanied their wards to school. At this point, parents of the Christian students demanded that the security personnel should also send back those students wearing hijabs, or allow their wards access to the school’s premises. An eyewitness confirmed that the Christian students were later allowed in, adding that “when the matter became chaotic, the policemen had to allow them in”. “The insistence by policemen that those in church robes would not enter the school infuriated CAN members, who insisted that what is good for the goose is also good for the gander and maintained that their children must be allowed into the school,” the eyewitness, who preferred to remain anonymous, said. Reacting to the rising tension in his community, the Oluwo of Iwoland yesterday vowed to meet with the state government on the backlash arising from the enforcement of the hijab ruling. He visited the school and ordered the two members of the Muslim community and CAN, who had converged at the gate of the school, to leave the environment and follow him for a meeting at his palace. The issue was later resolved by the monarch who said he would forward the resolution of the meeting to the state government. Speaking on the development, Oba Adewale confirmed that he met with leaders of the two religions in his palace and assured the people that the matter would be resolved amicably. The CAN and Muslim representatives at the meeting included Catechist Paul Olagoke and Alhaji Idris Fasasi Magaji, who both confirmed the meeting with the community’s monarch and appealed to adherents to allow peace to reign in the town. However, the state CAN Chairman, Rev. Ogundiya, insisted yesterday that Christians would continue to fight for their rights, adding that no threat would deter them.